40th birthday wishes mark a major milestone — turning the dreaded age of 40 — making it official that the birthday boy or girl is now middle-aged (i.e., old), which only makes it harder to choose a "happy" birthday message for your 40-year-old loved one. When someone you know turns 40, striking the right balance between celebrating this major milestone and avoiding the whole "middle age" thing is difficult, especially if the birthday girl or boy are going to be reluctant fortysomethings. But it's not impossible. The right 40th birthday greeting offers you a "happy medium" that you (the message giver) can be proud to give and your loved one (the recipient) will be happy to receive. On this page, it's easy to find what you need, since all I have here are the right birthday greetings for the 40th birthday girl or boy. Turning 40 is a major milestone. It can be tough for some people — because it means they’re now middle-aged. 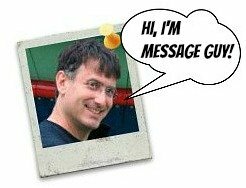 For this reason, figuring out what message to write can be difficult. First, you need to look inside and determine what you want to say. This is a little harder than it sounds. You must decide what and how you want to express about turning 40 (whether or not you've actually turned 40 yourself). If you want to make light of becoming middle aged, the funny route is the way to go. 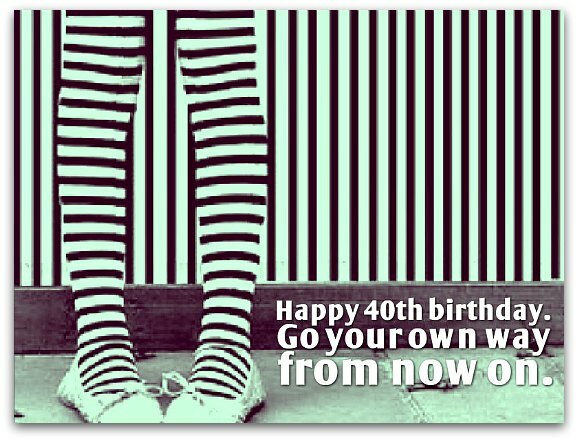 If you want to be serious about turning 40, you can opt for a sentimental or inspirational greeting. If you have no thoughts about this milestone, pick a generic "Happy Birthday" message. Bottom line: This decision takes a little bit of introspection, so take the time to think about your feelings. The second factor, while easy to navigate, is probably just as important as what you want to say: it's the personality of the birthday boy or girl. Accordingly, go the funny route with people who can laugh at themselves. Be serious with anyone who is easily offended by jokes or is in serious need of inspiration. The third factor — the background of the birthday boy or girl — is often overlooked. Here, you have to consider his or her religious beliefs, lifestyle, income bracket, education and other personal matters, which could influence how he or she takes your 40th birthday wishes. May all the dreams you've ever had in the last 39 years start to be fulfilled on your 40th birthday! You're no longer 30-something. You're now a 40-somebody! It's time to make your 40th birthday a real humdinger! Wishing you not only a deliriously happy 40th birthday but also a lifetime of immense joy, inner peace and true success! Happy birthday! Hoping your 40s will feel incredibly new and exciting like your 20s — only doubly so! Sure, your 30s are over. Good riddance, I say. The 40s are going to be so much better...in every way. So enjoy your 40th! You and wine have plenty in common. Like wine, you get more and more delicious every year — certainly more priceless. Now let's celebrate your 40th birthday! What's on the mind of your average 40 year old? Recently, I came across two interesting Huffington Post articles about turning 40: Life begins at 40 and Why I choose not to round up in life. Both articles show how 40 year olds think, which should help you choose from the birthday messages in this section. Click here to find out how women see 40 in Life begins at 40. Click here to see what men think about 40 in Why I choose not to round up in life. Say goodbye, adieu, adios, arrivederci, cheerio, sayonara, au revoir, so long to your 30s. May they rest in peace! Say hello, howdy, bonjour, buenos dias, what's up to 40! Long live the 40s. Life does begin at forty. Your kids may not think so, but what do they know anyway? Your 40th birthday is a new beginning! It's the perfect time to reinvent yourself! Happy birthday to someone who is still young, alive and kicking! You really have to stop kicking everyone — you're 40, for goodness sake. That common element is positivity — positivity about getting older and still looking your best. At 40, people start to notice wrinkles and other signs of aging. They also become very aware of their mid-age status. Both concerns are obliterated (if only for a moment) by positive 40th birthday wishes like the ones below. Happy birthday! Even at 40, you look half your age. You should really bottle up and sell whatever you're doing to stay so incredibly young-looking. Happy birthday! You simply look amazing. In all fairness, start aging like a normal person and give the rest of us a break. Happy birthday! At 40, your body may not always do what you want it to do but your mind is as sharp as ever. That's why you should only exercise your mind, not your body. There's a bright side to hitting 40. It's definitely better than the alternative — turning 41. Have a happy 40th! 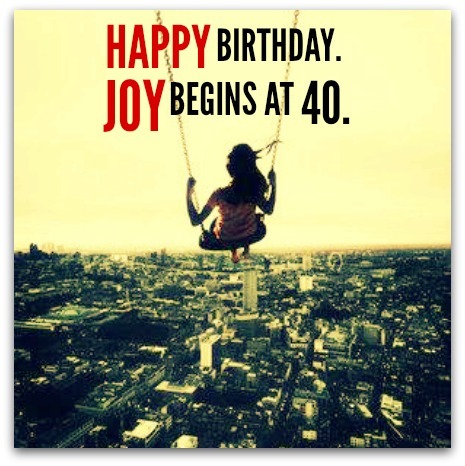 Joy begins at 40. Happy birthday. It’s not your 40th birthday we're celebrating today — it’s actually the second anniversary of your 39th birthday. Happy 40th birthday! Life is short. Now that you're 40, it's even shorter. Happy 40th birthday! Happy birthday! At 40, you gain a whole new view on life — courtesy of your new bifocals.